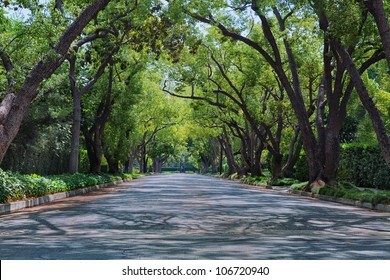 419 stock photos, vectors, and illustrations are available royalty-free. 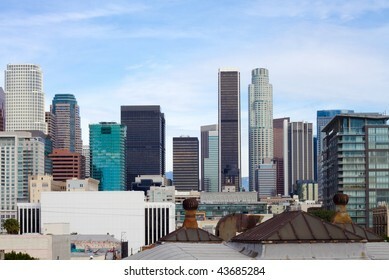 Early morning light on the Los Angeles skyline. 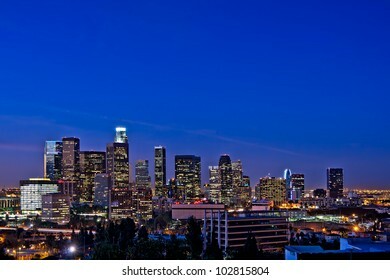 Los Angeles skyline at night with a clear sky. LOS ANGELES - JULY 27: Walt Disney Concert Hall in Los Angeles, CA on July 27, 2011. 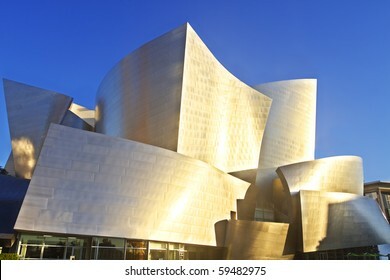 The hall was designed by Frank Gehry and is a major component in the Los Angeles Music Center complex. 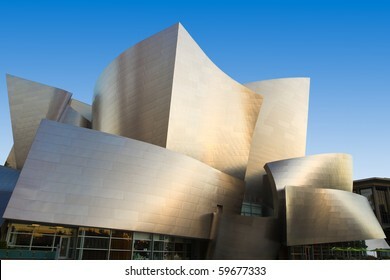 LOS ANGELES - AUGUST 8: Walt Disney Concert Hall in downtown Los Angeles on August 8, 2011. 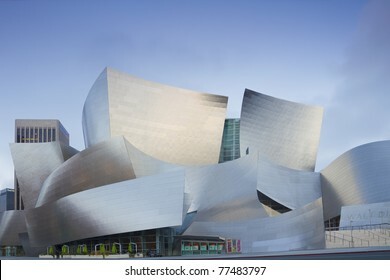 The concert hall houses the Los Angeles Philharmonic Orchestra and is a design by architect Frank Gehry. 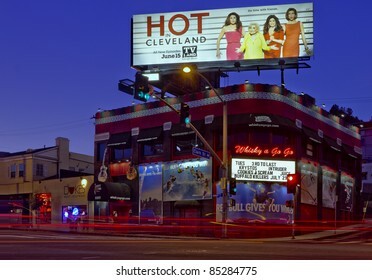 LOS ANGELES - MAY 17: Tourists flock to nightlife businesses on Hollywood Boulevard on May 17., 2011 in Los Angeles. Restaurants, nightclubs, and theaters attract tourists from all over the world. LOS ANGELES-MARCH 1: Michael Jackson's star on the Hollywood Walk of Fame on March 1, 2011 in Los Angeles. The singer's star and the Walk of Fame draw tourists from all over the world. 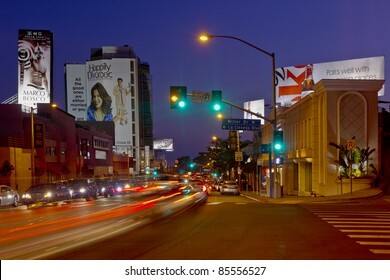 LOS ANGELES - JULY 5: Traffic and tourists pack the Sunset Strip located in Los Angeles' July 5, 2011. 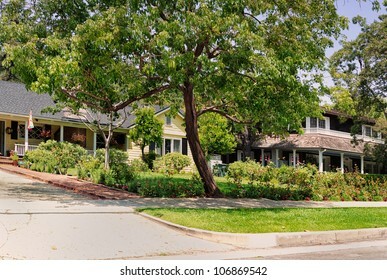 The highest concentration of celebrities in Los Angeles live in this part of the Hollywood Hills. 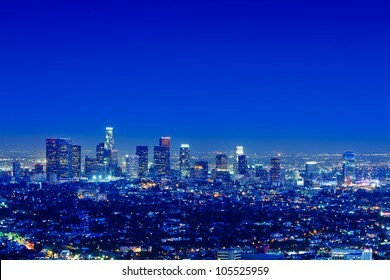 Los Angeles skyline at night with blue night sky. 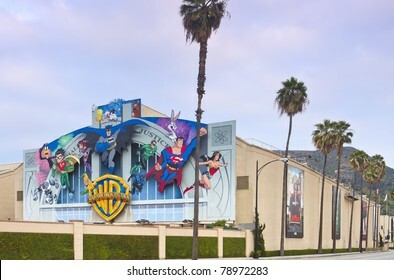 LOS ANGELES - MAY 22: Warner Bros Movie Studio on May 22, 2011 located in Burbank, CA an area near Los Angeles. The iconic studio remains an important tourist attraction to the Los Angeles area. LOS ANGELES - OCT 30, 2011: The Staples Center at LA Live in the early morning before the Rock 'n Roll Marathon in Los Angeles on October 30, 2011. 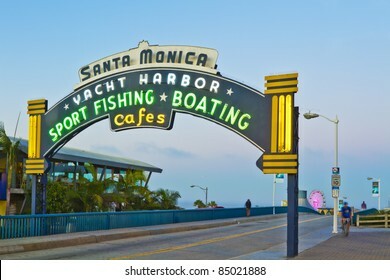 LOS ANGELES - AUGUST 3: Sign welcoming visitors to the Santa Monica pier located in Santa Monica, California on August 3, 2011. The amusement park on the pier is a world-famous tourist attraction. 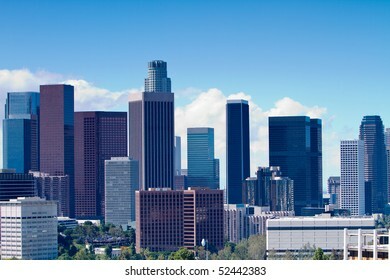 Los Angeles skyline on a sunny day with blue sky. 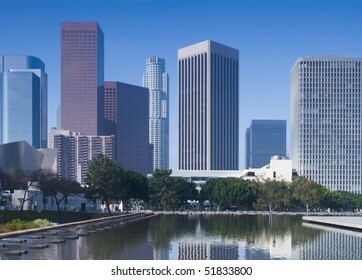 LOS ANGELES - AUGUST 23: The warm morning sun bathes Frank Gehry's modern architectural design of the Walt Disney Concert Center and gives the city of Los Angeles a distinctive skyline. August 23, 2010. 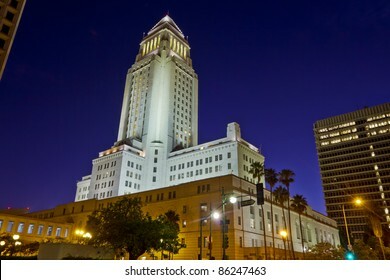 Los Angeles City Hall at nighttime shot from ground level. with other Civic Center building framing the shot. 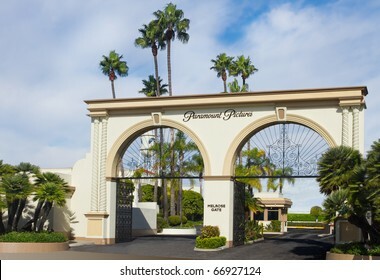 LOS ANGELES-NOVEMBER 27:The main gate to Paramount Studios on November 27, 2010 in Los Angeles. The iconic studio continues filmmaking since 1931 and remains the one actually located in Hollywood. 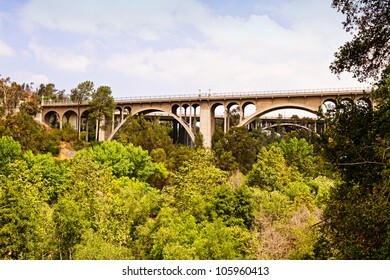 Bridges as metaphor for passages. 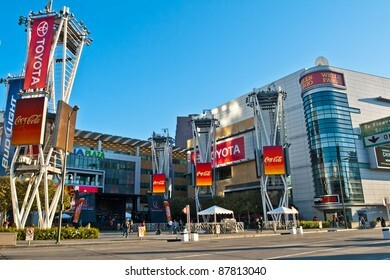 LOS ANGELES - JULY 12: The Sunset Strip located in Los Angeles on July 12, 2011. 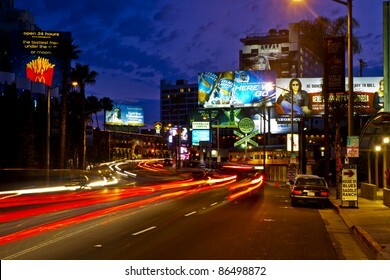 The area is popular with both tourists and locals and is a famous it's billboards and celebrity hang-outs. 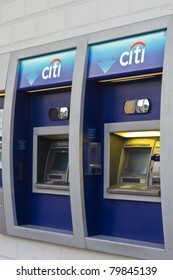 LOS ANGELES - JUNE 7: An ATM machine at Citibank on June 7, 2011 located in Los Angeles, California at a branch outlet of the bank. 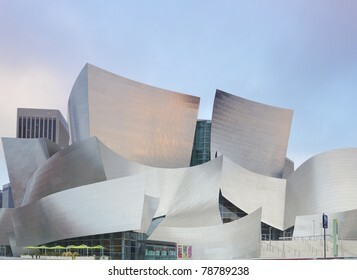 LOS ANGELES-AUGUST 21: Frank Gehry's iconic and distinctive modern architecture of the Disney Concert Hall gives the Los Angeles skyline it's readily identifiable characteristic. August 21, 2010. 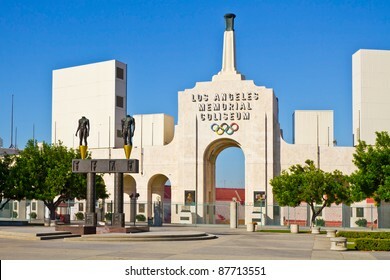 LOS ANGELES - MAY 11: Walt Disney Concert facade on May 11, 2011 in LA. 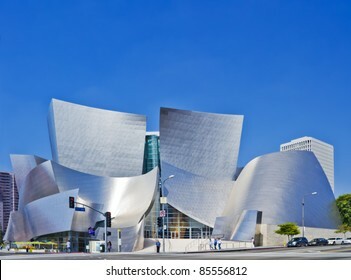 The concert hall houses the Los Angeles Philharmonic Orchestra and is a design by architect Frank Gehry. 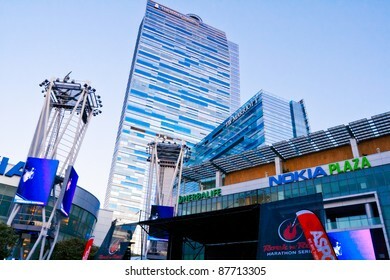 LOS ANGELES - OCTOBER 30: Nokia Plaza band stand at LA Live in Los Angeles before the start of the Rock 'n Roll Marathon in Los Angeles on October 30, 2011. LOS ANGELES - JULY 19: The Whiskey A Go-Go nightclub located on the Sunset strip in Los Angeles on July 19,2011. The club has been an instrumental venue on the touring circuit of BANDS since 1964. 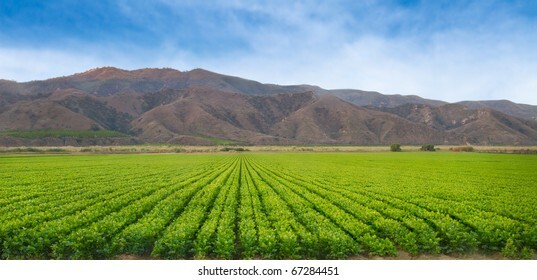 Representative of the California Agriculture Industry. LOS ANGELES - AUGUST 3: Sign welcoming visitors to the Santa Monica Pier amusement park in Santa Monica, CA on August 3, 2011. A popular tourist attraction, the pier is a setting for many movies. 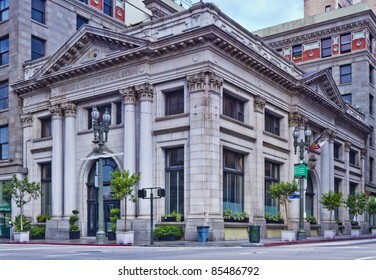 LOS ANGELES - JULY 31: Farmers & Merchants National Bank located in downtown Los Angeles, CA on July 31, 2011. The bank building is listed as an historical landmark for it's distinctive architecture. 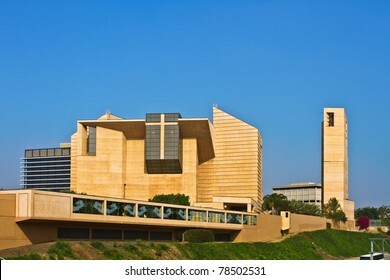 LOS ANGELES, CA - MAY 6: Our Lady of the Angels Cathedral on May 6, 2011 located in the downtown area of Los Angeles serves an Archdiocese of over 4 million Catholics. 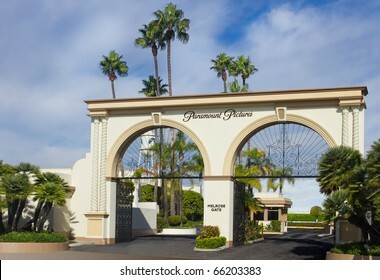 LOS ANGELES-NOVEMBER 27: The main gate to Paramount Studios on November 27, 2010 in Los Angeles. 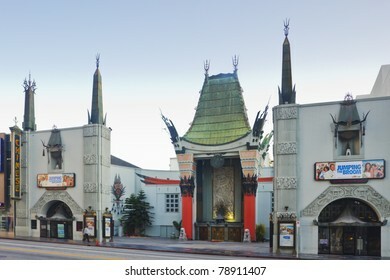 The iconic studio continues filmmaking since 1931 and remains the one actually located in Hollywood. 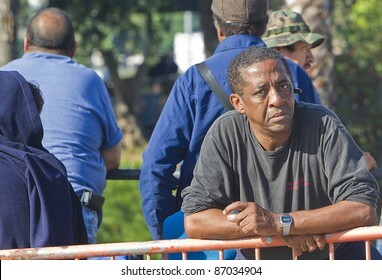 LOS ANGELES - OCTOBER 17: An unidentified man is among many without medical insurance who wait in long lines around the block to see doctors at a free medical clinic at the Sports Arena in Los Angeles, CA on October 17, 2011. LOS ANGELES - MAY 17: Tourists congregate in front of Grauman's Chinese Theater on May 17, 2011 in Los Angeles. 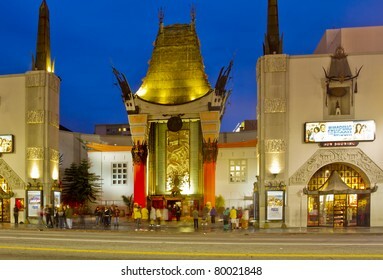 The theater is famous for it's celebrity hand prints cast in concrete on Hollywood Blvd. LOS ANGELES - OCT 30, 2011: Nokia Plaza at LA Live in the early morning before the Rock 'n Roll Marathon in Los Angeles on October 30, 2011. 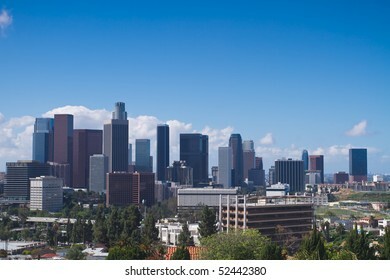 Los Angeles city skyline on a sunny day with blue sky. 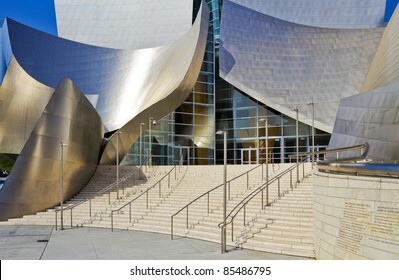 LOS ANGELES - AUGUST 8: Facade and main entrance of the Walt Disney Concert Hall in downtown Los Angeles, CA on August 8, 2011. 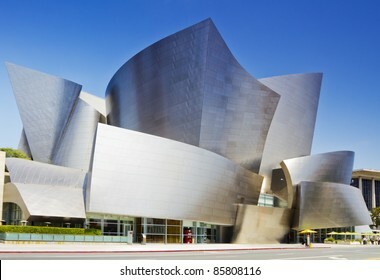 The Frank Gehry design is the centerpiece of the Los Angeles Music Center. 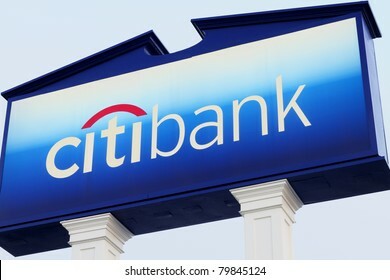 LOS ANGELES - JUNE 7: A sign with logo of Citibank on June 7, 2011 located in Los Angeles, California at a branch outlet of the bank. 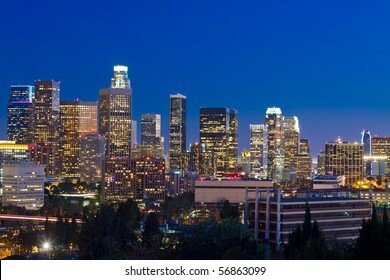 Wide angle panorama image of Los Angeles skyline and city at night. 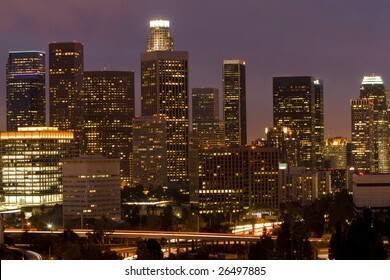 Panorama view of Los Angeles cityscape at night. 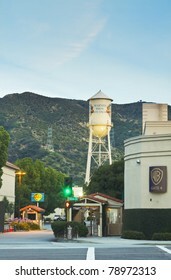 LOS ANGELES - JUNE 3: Warner Bros. motion picture studio, Gate 4, on June 3,2011 located in Burbank, California. The iconic studio remains an important tourist attraction in the Los Angeles area. 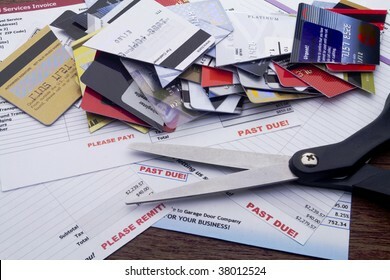 Overdue household bills with scissors and cut up credit cards indicating resolve to economize. 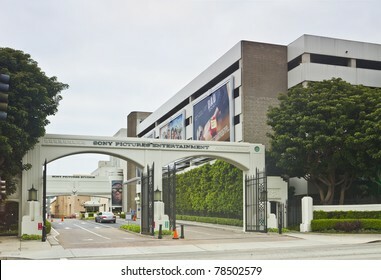 LOS ANGELES, CA - MAY 13: The Culver City main gate of Sony Pictures Entertainment on May 13, 2011 in Los Angeles. The studio lot contains the iconic former MGM Studios and Columbia Pictures. 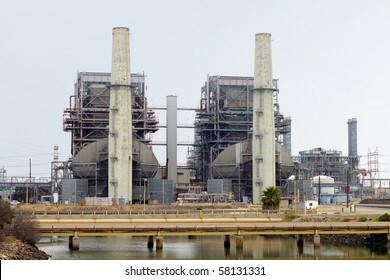 Electrical power generation plant on an overcast day. 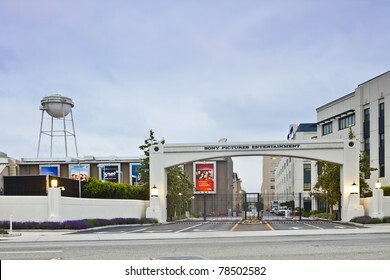 LOS ANGELES, CA - MAY 13: The Culver City east gate of Sony Pictures Entertainment on May 13, 2011 in Los Angeles. The studio lot contains the iconic former MGM Studios and Columbia Pictures. 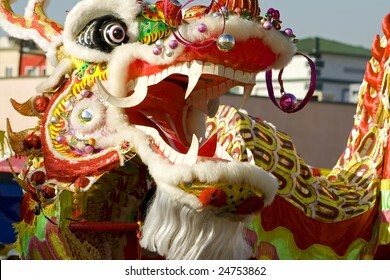 Annual Chinese New Year Parade in Los Angeles. 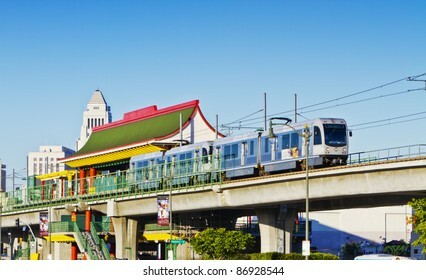 LOS ANGELES - JUNE 30: The Metro Gold Line train bound for east Los Angeles departs the Chinatown Station on June 30, 2011. The extension of the Gold Line to East Los Angeles has doubled ridership. 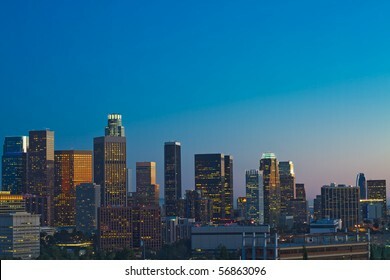 Los Angeles skyline at dusk with blue night sky. LOS ANGELES, USA - OCTOBER 15: Demonstrators March in the Occupy LA Protest through downtown Los Angeles to the City Hall on October 15, 2011. 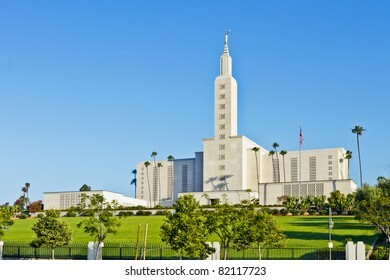 LOS ANGELES - JULY 17: The Los Angeles Temple of The Church of Jesus Christ of Latter-day Saints, the second largest Mormon temple in the world, located in the Westwood on July 17, 2011, LA. 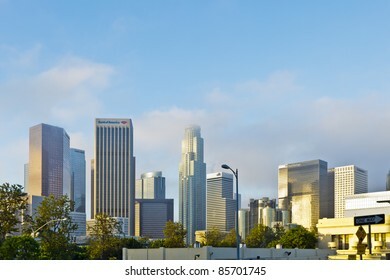 Los Angeles skyline at sunrise on a bright, sunny day. 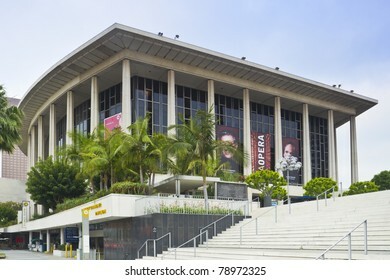 LOS ANGELES - May 26: The Dorothy Chandler Pavilion on May 26, 2011 located in the Music Center in downtown Los Angeles. The theater is the venue for many award-winning operatic and orchestral events. 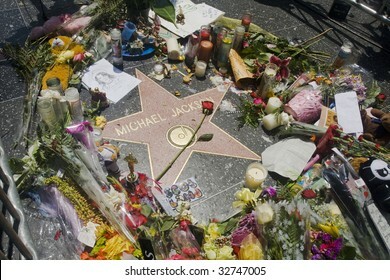 LOS ANGELES - JUNE 26: Michael Jackson's star on the Hollywood Walk of Fame in Los Angeles, CA, as fans gather and leave flowers and momentos to remember the artist and say goodbye following his death on June 25, 2009. LOS ANGELES - MAY 26: Walt Disney Concert Hall facade on May 26, 2011 is located in the Music Center in Downtown Los Angeles. 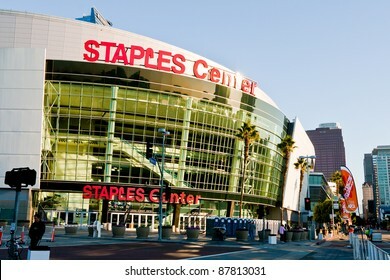 The concert hall houses the Los Angeles Philharmonic Orchestra. 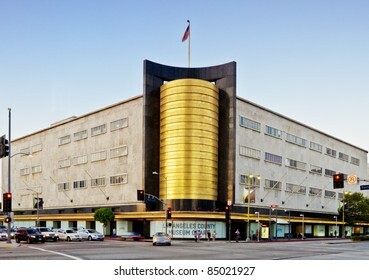 LOS ANGELES - June 8: Formerly the May Co department store and now LACMA WEST in Los Angeles on June 8, 2011. The building is to undergo an extensive renovation to house the modern collection. 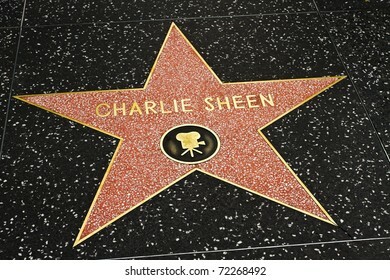 LOS ANGELES-MARCH 1: Charlie Sheen's star on the Hollywood Walk of Fame on March 1, 2011 in Los Angeles. 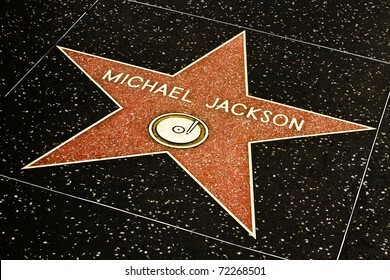 The actor's star and the Walk of Fame draw tourists from all over the world. 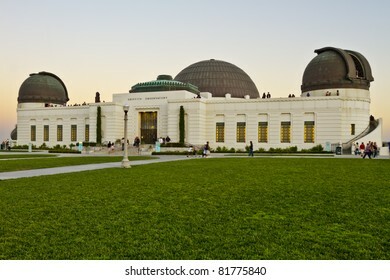 Griffith Observatory at the top of the mountain in Griffith Park in Los Angeles. 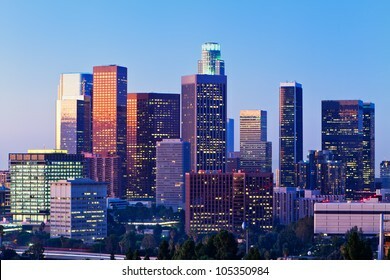 Skyline of Los Angeles shown at early dusk with blue sky. 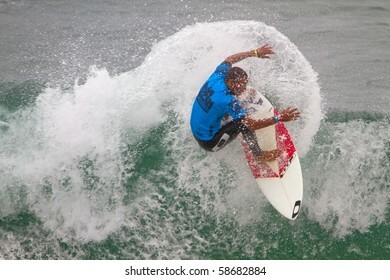 HUNTINGTON BEACH, CA-AUGUST 8: Jadson Andre of Brazil competes in the Men's Quarter Heat Sunday, August 8, 2010 in Huntington Beach. The event ends today with an award's ceremony. 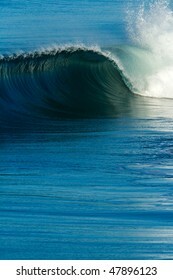 Pacific Ocean waves and surf. 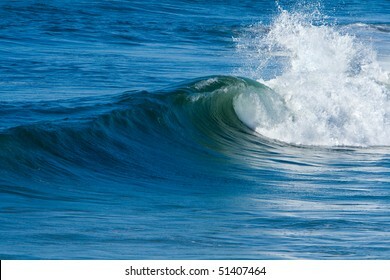 Blue ocean and surf with waves on bright, sunny day. 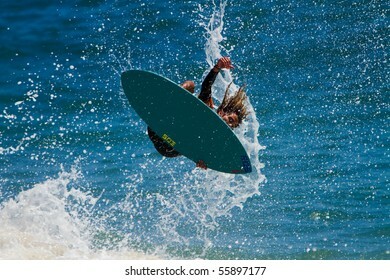 LAGUNA BEACH, CA-June 19: Surfer skims in the 34th Annual Victoria Skimboards World Championship in Laguna Beach, CA. Competition was held on June 19 & 20, 2010 and sponsored by SkimChicks. 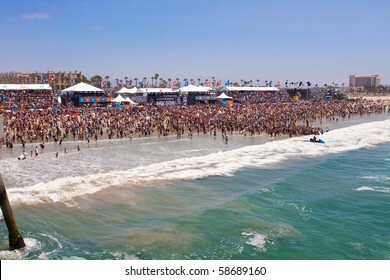 HUNTINGTON BEACH, CA-AUGUST 8: Massive crowds pack the beach for the U.S. Open of Surfing Championships Sunday, August 8, 2010 in Huntington Beach. The event ends Sunday with an award's ceremony. 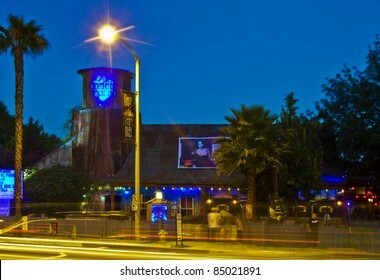 LOS ANGELES - JULY 12: The House of Blues nightclub located in Los Angeles on July 12, 2011. 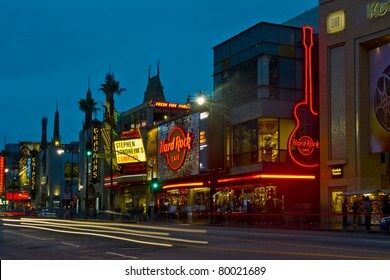 The nightclub presents live music acts nightly to large crowds of tourists and locals on the Sunset Strip. 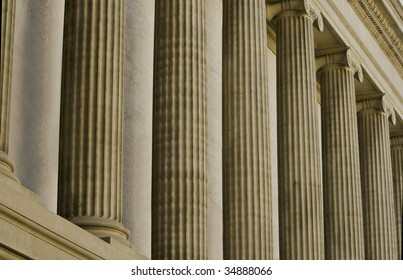 Representative classic architecture of financial institution. 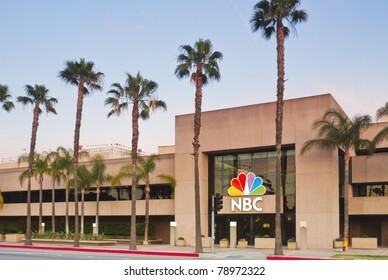 LOS ANGELES - MAY 22: NBC Television Production Center on May 22, 2011 located in Burbank, California. The iconic network remains a major force in the entertainment industry of Southern California. 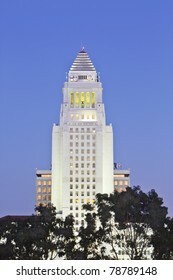 Los Angeles City Hall at dusk. 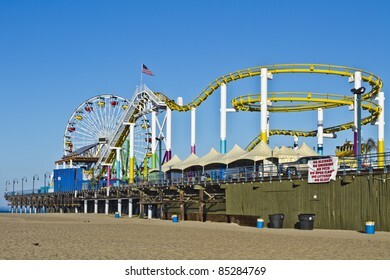 LOS ANGELES - August 3: The amusement park on the Santa Monica Pier in Santa Monica, California on August 3, 2011. 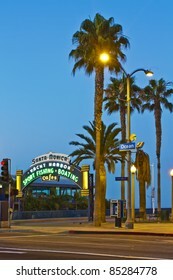 A popular tourist attraction, the Pier is a familiar setting for many movies. 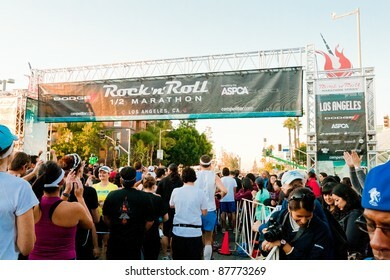 LOS ANGELES - OCTOBER 30: Rock 'n Roll Marathon at LA Live in Los Angeles on October 30, 2011. 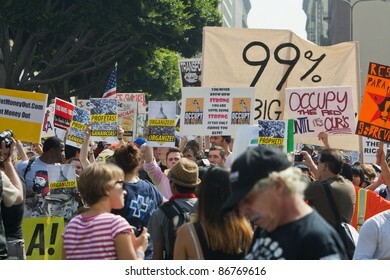 LOS ANGELES-FEBRUARY 26: Protesters demonstrate at the Rally To Save The American Dream. 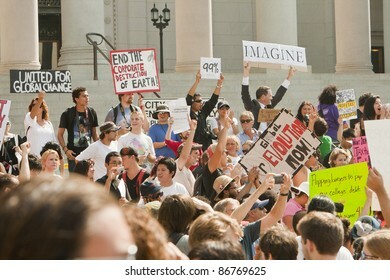 Rallies were held nationwide in major cities February 26, 2011 in LA. PASADENA, CA - OCTOBER 12: Supporters of the Occupy Wall Street protest rally as Occupy Pasadena in front of major banks on October 12, 2011 in Pasadena, CA. 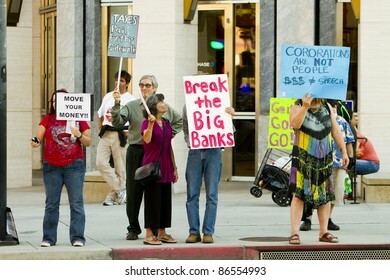 PASADENA, CA - OCTOBER 12: Supporters of the Occupy Wall Street protest rally in Pasadena as Occupy Pasadena in front of major banks on October 12, 2011. 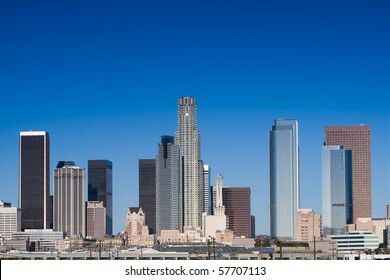 Los Angeles skyline in early morning with clear, blue sky. 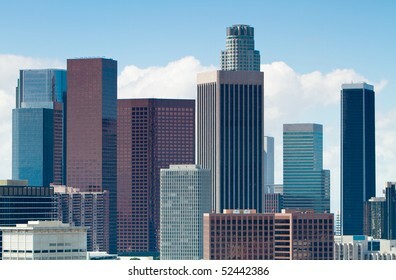 LOS ANGELES - JULY 20: The skyline of downtown Los Angeles on July 20, 2011. 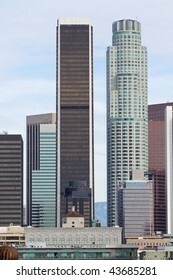 The downtown center of Los Angeles was developed largely between 1970 and 1992. LOS ANGELES - MAY 28: Grauman's Chinese Theater on May 28, 2011 located on Hollywood Boulevard in Hollywood, California. Hand prints of celebrities are ensconced in front of the building. 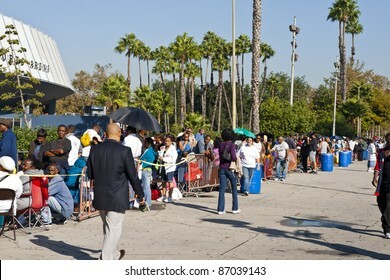 LOS ANGELES - OCTOBER 17: People without medical insurance wait in long lines around the block to see doctors at a free medical clinic at the Sports Arena in Los Angeles, CA on October 17, 2011. 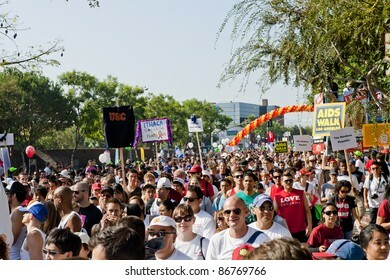 WEST HOLLYWOOD, CA - OCTOBER 16: Thousands of marchers walk through the streets of West Hollywood and Los Angeles to benefit the fight against AIDS by AIDS PROJECT LOS ANGELES on October 16, 2011. 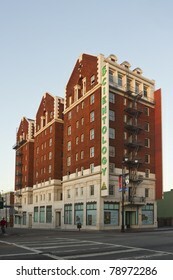 LOS ANGELES - JUNE 29: The Scientology Testing Center, located in Hollywood on June 29, 2011. 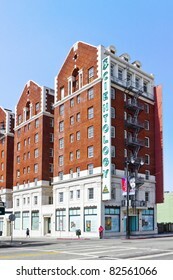 Originally the Christie Hotel, the building is Hollywood Historical Marker #38. 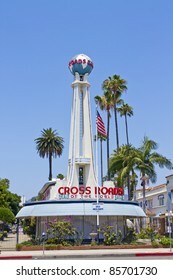 LOS ANGELES - JULY 29: The Crossroads of the World Building in Los Angeles on July 29, 2011. Considered America's first shopping mall, it is designed to resemble an ocean liner. 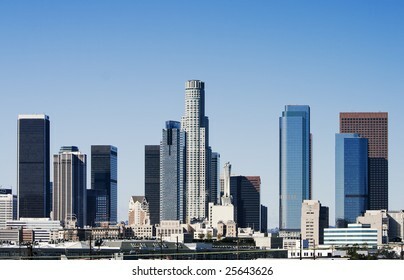 LOS ANGELES - JULY 17: The skyline of the City of Los Angeles, CA on July 17, 2011. 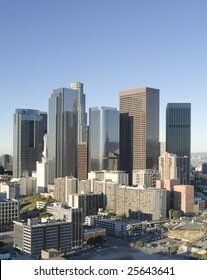 The downtown center of Los Angeles was developed largely between 1970 and 1992. 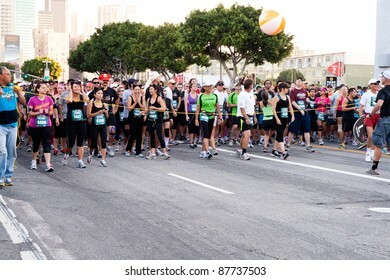 LOS ANGELES - OCTOBER 30: Participants line up at the starting gate at the Rock 'n Roll Marathon at LA Live in Los Angeles on October 30, 2011. 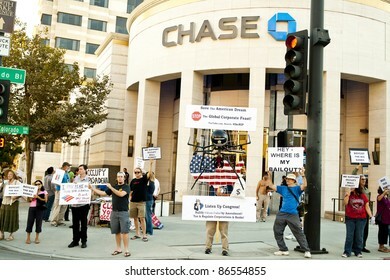 Los Angeles-February 17: Demonstrators protest premium increases at Anthem Blue Cross headquarters in Los Angeles on February 17, 2010. 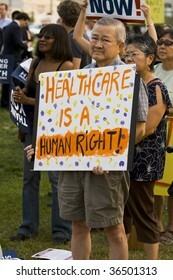 Health care reform rallies are being held across the country. 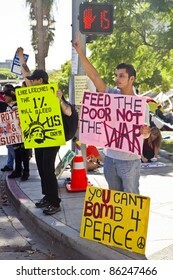 LOS ANGELES, CA-JUNE 24: Protesters gather outside headquarters of The Western Justice Foundation on June 26, 2010. 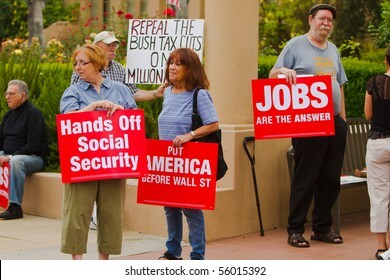 Rally was organized to protest against Social Security and Medicare budget cuts. 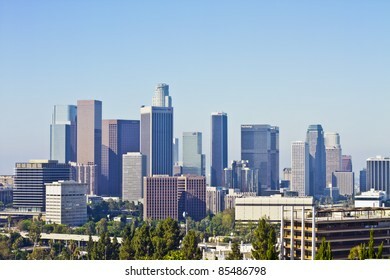 Los Angeles skyline on a sunny day. LOS ANGELES - MAY 28: L. Ron Hubbard Scientology Center on May 28, 2011, located on Hollywood Blvd. 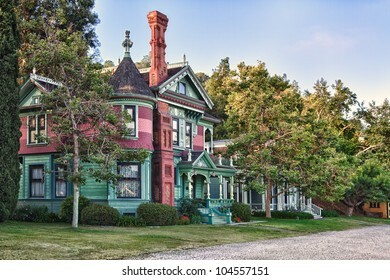 in Los Angeles. The building houses counseling services for the religious organization. 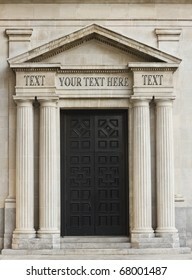 Classic architecture representative of financial institution with replaceable text on layers. 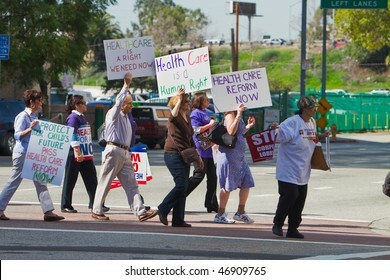 Los Angeles-September 3: Supporters of healthcare reform gather at a city park on September 3, 2009 in Los Angeles. 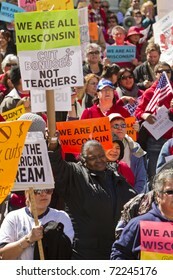 Rallies and town hall meetings are being held throughout the country. 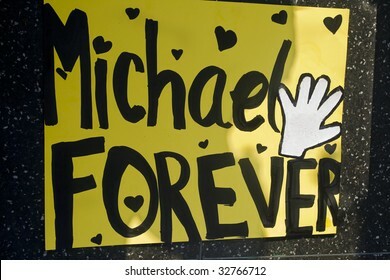 LOS ANGELES - JUNE 27: Michael Jackson's star on the Hollywood Walk of Fame as fans gather to remember the artist and leave messages to say goodbye following his death on June 25, 2009. 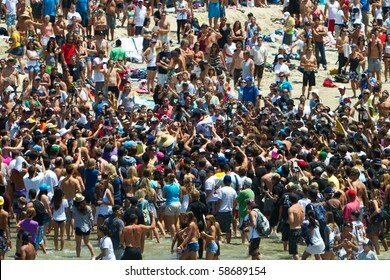 HUNTINGTON BEACH, CA-AUGUST 8: Crowds carry Brad Simpson to the winner's circle as the World Champion of the Men's competition Sunday, August 8, 2010 in Huntington Beach. 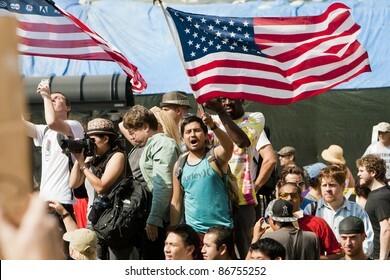 LOS ANGELES - OCTOBER 15: Demonstrators protest at the Occupy LA march through downtown Los Angeles as committed participants wave American flags on October 15, 2011. LOS ANGELES - OCTOBER 8: Unidentified protesters demonstrate at city hall on October 8, 2011 in Los Angeles, CA as part of the Occupy LA event on Oct. 8, 2011. The protesters are encamped on the lawn of City Hall. 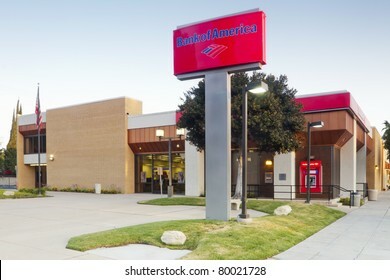 LOS ANGELES - MAY 20: A Bank of America branch bank located in Burbank, California, near Los Angleles on May 20, 2011. 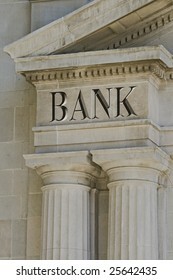 The bank is a major participant in the on-going economic crises in the U.S.